In 1931 the United States was two years into the Great Depression, with an unemployment rate of 15.8 percent, nearly double the previous year. Jobs were hard to find, and what jobs there were generally came with lower salaries than before. Breadlines, soup kitchens, and the number of homeless persons were on the rise. Baseball was one thing that could provide a diversion. Boston Red Sox faithful had been optimistic about the club’s chances, after six straight last-place finishes (1925-30). Going into the season's final week, the Boston Herald even reported that “the Red Sox … have staged a surge which has carried them to the top of the second division.”1 Even though the Red Sox were improving on the field, home attendance had dropped over 20 percent, from 444,000 in 1930 to just under 351,000. The Braves, who had looked forward to the season after a 14-game improvement in 1930 had moved them from last to sixth in the standings, instead took a step backwards. Buoyed by a surge in interest in the early part of the season, though, the Braves actually showed an increase in attendance of about 10 percent. Throughout the majors, teams were looking for ways to help fans who had fallen onto hard times. As the season entered September, teams began looking for open dates in their schedules to stage benefit games for the local charities and unemployment funds. On September 9 the Cubs and White Sox met at Chicago’s Comiskey Park and the New York Giants and Yankees faced off at Yankee Stadium. In late September the Cardinals-Browns game was the big attraction in St. Louis, as was the Athletics-Phillies tilt in the City of Brotherly Love. The Reds and Indians staged an Ohio showdown. The planned New York City Series was canceled and replaced by a charity doubleheader on September 24 at the Polo Grounds. The National League Giants and Robins paired off in the opening game, followed an hour later by a game between the Robins and Yankees – with players from all three teams participating in a field meet during the intermission. 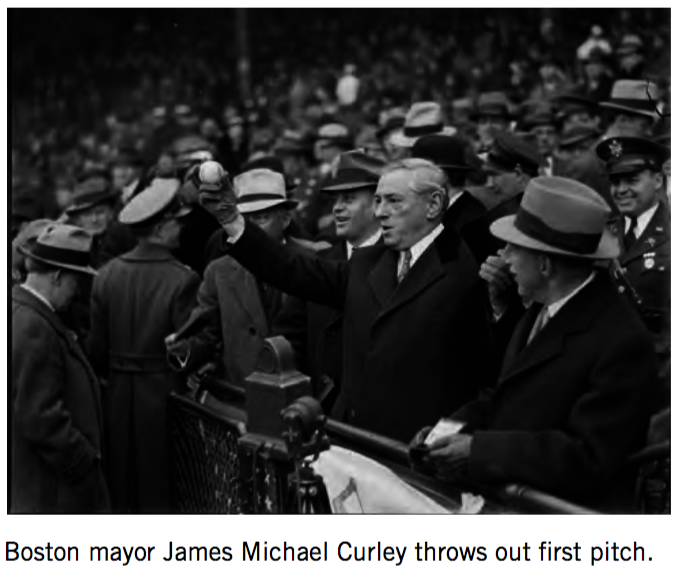 In Boston, Mayor James Michael Curley spearheaded a charity game, proposing that all funds raised should be donated to the Boston City Unemployment Fund. The Braves and Red Sox wanted to cooperate, of course, but had a hard time finding a date to schedule the game. The Braves were scheduled for a 20-day road trip, September 3-22, ending with a Tuesday game in Cincinnati, and returning home for a season-ending series against the Phillies September 25-27. (which ended up as a doubleheader on the 27th). The Red Sox had gotten to enjoy home cooking for a 23-game, 19-day stretch from September 4-22. They then were to play games in Philadelphia on September 23-26 and a season finale in Washington on September 27. The only way the hoped-for charity game could be scheduled was to wait until the Braves were back in Boston, and then to postpone the Red Sox’ road trip by a day. The Athletics agreed to eliminate the opening game of their series, allowing the Red Sox to remain in Boston for the charity game on September 23. Braves Field, the larger of the two Boston ballparks, was chosen as the site for the game, since it would allow more spectators to attend. Once arranged, the game would actually be the third time the teams had met in Boston that season. The Red Sox had won the first two exhibition contests, played in the early spring, so the Braves were bent on revenge. In truth, they were looking for some way to end their season on a positive note. Since September 1, the Braves had been in a tailspin, winning only 4 of 25 games, and falling from fifth place to sixth in the National League. The Red Sox were also below .500 for the month, being victorious in 12 of 25 decisions, but had moved up from last place to fifth during that stretch. The benefit game and associated activities were judged to be both artistically and financially successful. Crowd estimates ranged from 20,000 to 25,000.2 Considering that the Red Sox had drawn an average crowd of about 5,750 per home game and the Braves averaged about 8,700, all parties had to be very pleased with the outpouring of fans. In pregame festivities, Mayor Curley gave a touching and eloquent speech, in which he thanked team presidents Emil Fuchs of the Braves and Bob Quinn, of the Red Sox, for the cooperation of the players of both teams, the four umpires, ticket sellers, ticket takers, the musicians’ union and members of the band, ushers, other team employees, volunteers, everyone in attendance, and most anyone else he could think of. A relay race was held by four-man teams from each club, who raced each other around the bases. For the Braves, Ed Brandt led off, running from home plate to first base, Johnny Neun ran the leg from first to second, Ben Cantwell covered the distance from second to third base, and Wally Berger from third to home. The Red Sox players covering the same respective legs were Bill Sweeney, Jack Rothrock, Bobby Reeves, and Rabbit Warstler. The Red Sox team won the event by one-fifth of a second over the Braves quartet. Next up on the program was an auction of autographed baseballs. Four balls went on the auction block – one each bearing the signatures of Mayor Curley, Babe Ruth, and Earl Webb (in the midst of his record-setting 67-doubles season), and a final ball signed by the entire Philadelphia Athletics team. The Athletics team ball netted $225 from Boston sportsman V. Bruce Wetmore. He had purchased stock in the Braves in 1927, and from time to time liked to fill in as an umpire in spring-training games. The autographed Philadelphia Athletics ball is probably as close as he ever got to a championship team. There was vocal and instrumental musical entertainment throughout the game, and a baby elephant amused the crowd by fishing for peanuts from the pockets of on-field participants. The benefit game itself was not played like a typical exhibition game, which would normally be rife with numerous player substitutions and rookie tryouts. Both teams fielded starting lineups that were almost identical to those used in their previous regular season games. The only changes, except for the starting pitchers and catchers on both teams, were in the Red Sox outfield, where an injury to Tom Oliver the previous day necessitated a substitution. In a highly unusual move for an exhibition game, each club started its best pitcher – Danny MacFayden (16-12) for the Red Sox against the Braves’ Ed Brandt (18-11). Red Sox center fielder Jack Rothrock led off the game with a high fly to his counterpart, Wally Berger, who camped under the ball, lost it in the sun, and then sidestepped to assure that he wouldn’t be hit in the head. Rothrock ended up on second base. Otto Miller scored Rothrock with a single to right, and advanced to third on Marv Olson’s hit. Olson was then caught trying to steal second, and Earl Webb’s single to left scored Miller. Four straight hits. Braves hurler Ed Brandt began to think that adding participation in a relay race to his pregame warmup routine may not have been of much help. MacFayden held the National Leaguers hitless through the first two innings, but the Braves broke through in the third when Al Spohrer walked, stole second, and was driven home on a double by newcomer Wolters/Walters.3 Wally Berger’s hit to center tied the score at 2-2. The score remained knotted until the sixth inning, when the teams switched from using the National League ball to the American League ball. The Braves found the AL ball to their liking. With one out, Earl Sheely walked and was replaced by pinch-runner/auctioneer Johnny Neun. Wes Schulmerich, wondering why he was not on the relay team, legged out an infield single. Neun and Schulmerich pulled off a double steal, then watched as Bill Urbanski struck out. Red Worthington then stroked a single to right-center, plating two runs, for a 4-2 Braves lead. The Red Sox mounted a threat in the seventh inning as Bill Sweeney singled and advanced to third on Hal Rhyne’s Texas Leaguer. Sweeney scored as Howie Storie grounded into a double play, bringing the score to 4-3. Neither team tallied again, and both starting pitchers closed out their work for the 1931 season with complete games. 1 The Red Sox were in fifth place in the American League on September 23, and they slipped one spot to finish the season in sixth place. 2 The Boston Herald, in its September 25 edition, reported that 19,369 tickets were sold, with 276 unused. Ticket sales amounted to $21,241, with an additional $547.50 in contributions, and $380 in the autographed-baseball auction (the actual amount was $395). 3 Fans of both teams could be forgiven if they had no idea who was playing third base for the Braves in this game. The press covering the game had problems with him, too. Most of the local papers called him “Walters,” while the Boston Daily Globe referred to him as “Wolters.” Perhaps the Globe’s scribes thought him to be the reincarnation of former big leaguer Harry Wolter, who as a member of the New York Highlanders had played in the inaugural game at Fenway Park on Opening Day 1912. This was, in fact, Bill “Bucky” Walters, who had joined the Braves on the road a week earlier, after a stellar season at Williamsport in the New York-Penn League. He would spend several seasons, including 1933 and 1934 with the Red Sox, as an infielder, before switching to the mound and becoming one of the premier pitchers in the National League over the next decade. This September 23 benefit game was his first appearance before the Boston fans. 4The Sporting News, September 24, 1931.